Martini srl presents a solution for the forming of double square bottom bags composed of a vertical packaging machine and a horizontal intermittent chain with different pneumatic stations. The modularity of this system allows the machine to adapt itself to the needs related to very different products. By combining the right weigher and the packaging machine it is possible to treat from dried fruit to fragile pasta shapes up to granular products. You can also customize the stations of the chain, for example by applying an open/close label to the bag. 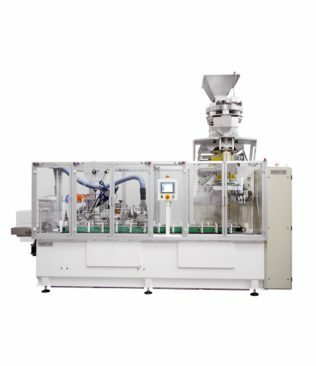 VFFS packaging machine with intermittent film motion for the bag preforming. Horizontal chain with intermittent motion, composed of two flanked and parallel horizontal chains, independently driven, which work in perfect electrical phase between themselves thanks to the 2 brushless motors. It is complete of various stations for the filling of preformed bags, the formation of upper flat bottom, the bag closure, the edge folding and overturning, the application of reclosable labels or adhesive tape (optional). 2 side by side and parallel chains, complete with step shovels, driven by brushless motors. Different stations with pneumatic motion to form the square top of the bags. Customizable with labels and tape repositionable adhesive tape application. Touch-screen control panel to set both machines. – Click for PDF brochure. *Maximum running speed referred to the model with transversal jaws motion by means of brushless motor. this value depends on the product, the bags weight, the packaging material and the infeed condition of the product.